When Tommy Taylor powered home a header from outside the penalty area against Preston North End in his first game for Manchester United, Reds supporters sensed they were in the presence of an extraordinary talent. The following five years, until he lost his life at Munich, were to prove them emphatically correct. Tommy was arguably the greatest centre-forward England, let alone United, ever had. He was certainly one of the most underrated and his scoring record would have been staggering in any era. For the Red Devils he managed two goals every three matches; put another way, he found the net once every two hours or so that he spent on a football pitch. On top of that he weighed in with a further 16 in 19 games for England and there was every reason to believe that, at 26, he was still approaching his peak. Yet when the all-time greats are mentioned, his name does not always crop up outside Old Trafford circles, I hasten to add. Tommy, a big, raw-boned Yorkshire lad, was snapped up from Barnsley for what was then a record fee �29,999 - as is generally known, Matt Busby did not want him burdened with a �30,000 tag and gave the extra pound to a tea lady. Soon it was apparent that United had got a bargain. The new boy, an ebullient character who quickly became popular with fans and colleagues alike, scored twice on his debut and by the end of the 1952/53 campaign he had notched seven in just 11 games. Unquestionably his greatest gift was for aerial combat, in which he had no contemporary peer. He could smack the ball with his forehead more forcefully and accurately than many players could kick it, his timing was uncanny and his bravery knew no bounds. This spectacular talent tended to obscure his other attributes, which were considerable. Perhaps because of his size, he could look clumsy on the ball but this belied excellent control and a sharp line in first-time distribution that made him devastating, particularly in tandem with Dennis Viollet. A strong, selfless player who had the stamina to spend 90 minutes at full stretch, Tommy was often at his best when drifting wide to the right, pulling defenders with him and interchanging positions with Johnny Berry. Such a ploy produced Johnny's unforgettable winner against Atletico Bilbao in the quarter-final of the 1956/57 European Cup. 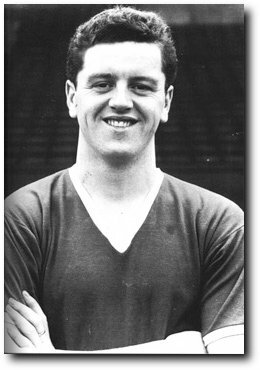 Tommy's growing stature in the world game was illustrated immediately after the 1957 FA Cup Final, in which he scored United's goal, when inter Milan made the then-astronomical offer of �65,000 for his services. The manager rejected the bid; his dashing young centre-forward was not for sale at any price. What a tragic shame that Matt was unable to enjoy the full fruits of his judgment.